The appetizers of Thanksgiving are always overlooked, right?? There’s so much spotlight on the turkey and the stuffing and the delicious pies that we tend to forget about the appetizer options we can lay out to keep our hungry guests at bay until the big fat turkey is done cooking. 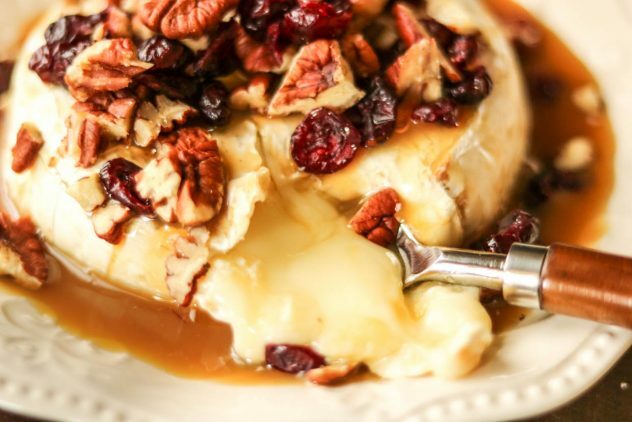 This cranberry caramel baked brie is super easy, and I mean ridiculously easy to prepare and will feed a crowd because a little goes a long way. 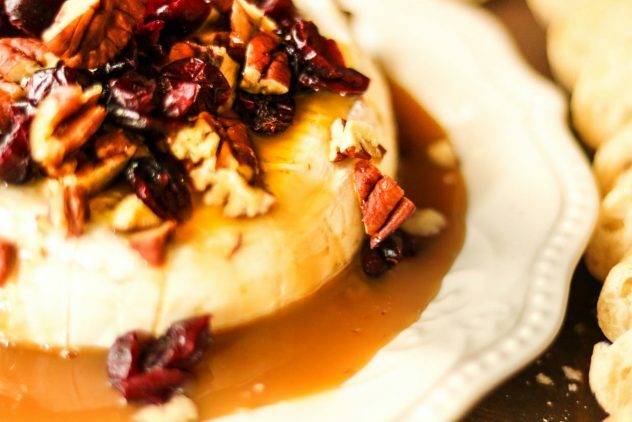 There’s a couple of options you can do for the caramel part of this dish. You can choose to use a homemade caramel sauce, like my Paleo Salted Caramel Sauce, however, if you’re overwhelmed at the thought of making another homemade dish and need a quick and easy appetizer, you can use a store bought caramel sauce, easy peasy! If you can’t have nuts, you can always leave out the pecans, or swap out the pecans for your favorite holiday nut. As you know, if you follow me, pecans are the only nut I’m not allergic to. You can honestly get as creative as you want with this, if you so choose. 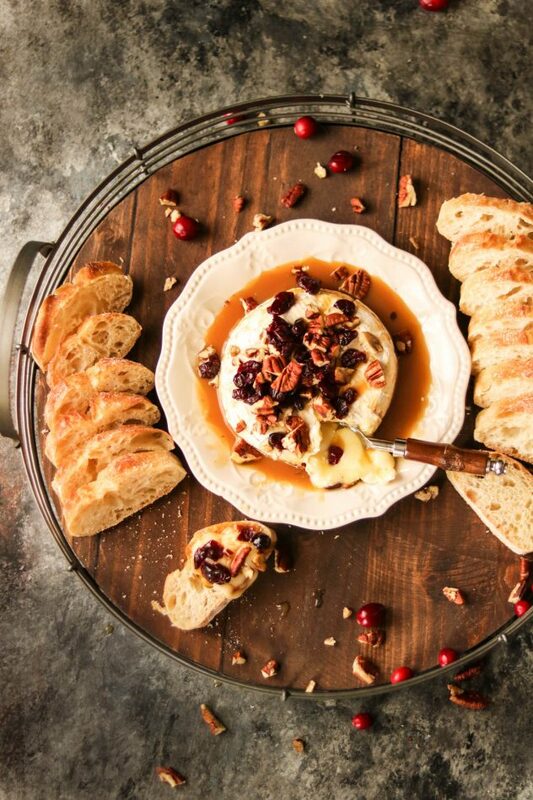 Serve this baked brie with a sliced baguette or your favorite crackers, whichever you prefer. 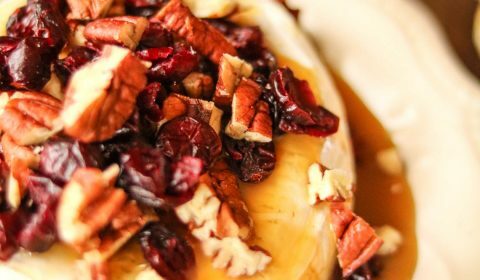 The mixture of the caramel sauce with the dried cranberries, couples with the nuts and the brie offer up the perfect sweet + salty savory combination. Bake for 15 minutes, top with your toppings and serve! 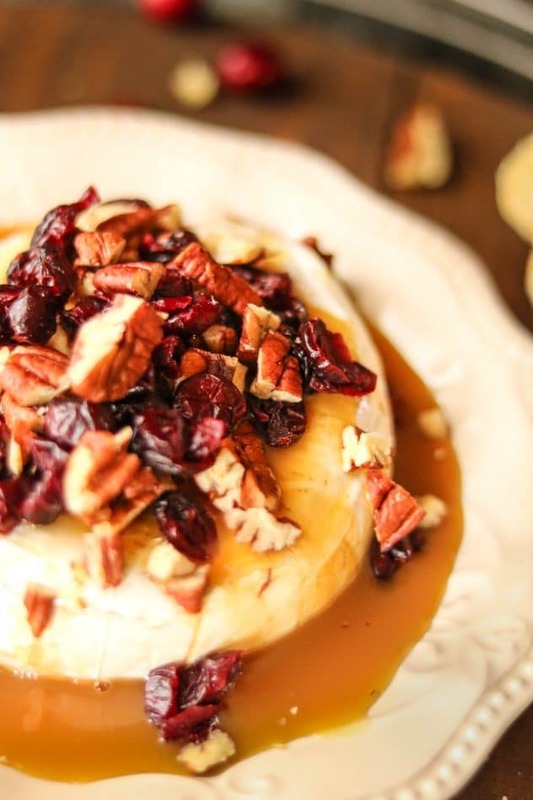 This cranberry caramel baked brie makes the perfect Thanksgiving appetizer to keep your hungry guests at bay! Place the Brie wheel onto a baking sheet. Once oven is preheated, cook for 15 minutes. Remove from oven and let cool for 5 minutes. Carefully transfer Brie wheel to serving plate. Top with caramel sauce, dried cranberries, and chopped pecans.